Hello friends! Autumn with you today to share more inspiration with our new Fancy Pumpkin die. I thought I would switch things up and make a tag this time. I embossed the pumpkin in brown, then tapped with my Versamark pad along the edges and re-embossed with gold. I was really pleased with this effect! I decided to use my favorite new stencil, plaid by Echo Park, and made an inky background with Distress Inks. I picked out a beautiful stamp and used an oval die to cut it out. I made a frame with the next size oval and embossed it with the same brown EP. I mounted the sentiment with two layers of foam and tucked in some paper flowers. I cut a banner from scrap inky card and tucked it in place to help fill in the gap in my design. I finished it off with a loopy bow. What fun! I hope you're inspired to have a play with embossing die cuts. I know you will love it. Thanks for visiting. 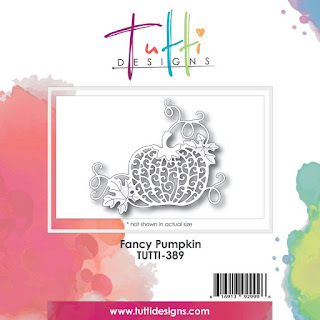 Purchase your Fancy Pumpkin die HERE today! Just BEAUTIFUL Autumn! Love how you tucked your flower petals under the sentiment panel. BEAUTIFUL and awesome inspiration!